More than 70 percent of full-time undergraduate students receive financial aid from the university, and philanthropic support from the George Washington University community helps make that a reality. This year, #GivingTuesday at GW has helped emphasize the powerful impact that philanthropy has on university students. Support from alumni, parents, faculty, staff, corporations, foundations and friends allows GW to provide scholarships to qualified students who could not otherwise afford a college education. 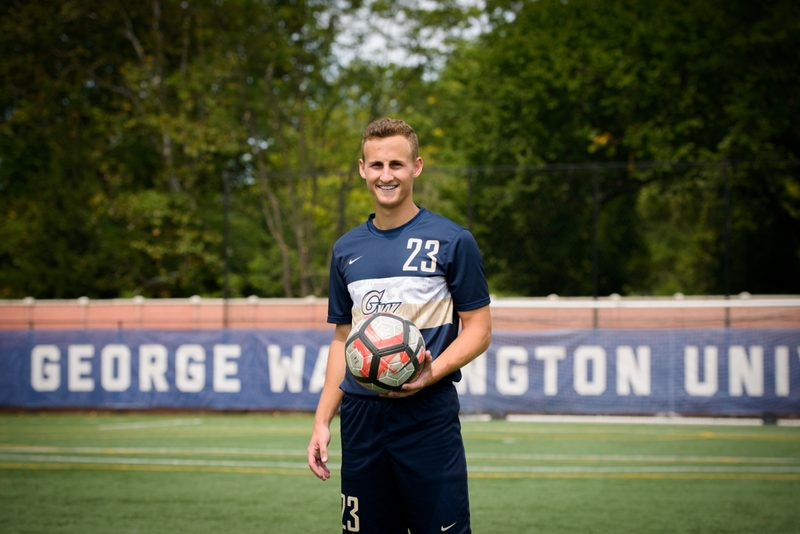 As a defender on the GW men’s soccer team, Sam Summerlin gets few chances to score. However, when it comes to his education, Mr. Summerlin is determined to assist in any way he can. Mr. Summerlin is a recipient of the Dombay Family Scholarship, which supports an undergraduate student-athlete studying business. GW swim team alumna Denise Dombay, B.B.A. ’88, created the scholarship as a way to give back. Mr. Summerlin said that Ms. Dombay also offers her time and advice. “Denise has helped me financially, but she’s also gone the extra mile and offered career assistance for me—and that’s something you really can’t put a price on,” he said. During her first week at GW, Kylie Madden watched President Obama speak at the 50th anniversary of the March on Washington. Ms. Madden has had a number of #OnlyatGW moments since then, such as hearing oral arguments at the U.S. Supreme Court and meeting two Democratic candidates for president of the United States. “These moments mean the world to me, and I am so fortunate to be in a place and at a university that easily facilitates these experiences,” Ms. Madden said. 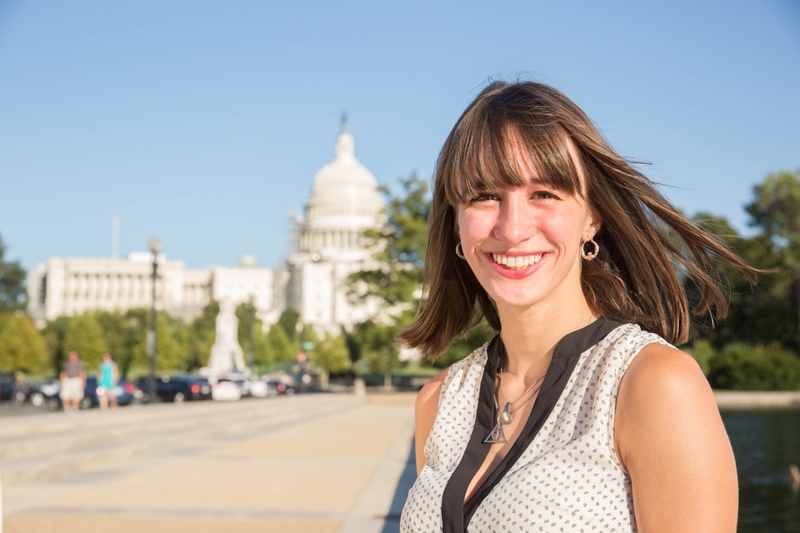 She also stays busy on campus as immediate past-president of the Adelphi Society, former director of communications for the GW Residence Hall Association (GW RHA) and co-chair of the Central Atlantic Affiliate for College and University Residence Halls Regional Conference for GW RHA. Ms. Madden is taking advantage of every opportunity thanks to the Simon Family Scholarship, a gift she says helped her “better appreciate” her experience at GW. “This award helps me worry less about the student loans I will have to pay off in the future, as it alleviates the necessity of more loans,” she said. After graduation, Ms. Madden plans to attend law school and may explore a career in political event management. She works for the GW Law Office of Alumni Relations as a student staff assistant and at Mischief Management, an event-planning company focused on fan-based community events. Mr. Williams’s experience has extended beyond the classroom as he maintains membership in the Biomedical Engineering Society and National Society of Black Engineers. He also participated in an international jazz residency at the John F. Kennedy Center for the Performing Arts and has served as pianist for the Voice Gospel Choir since his freshman year. 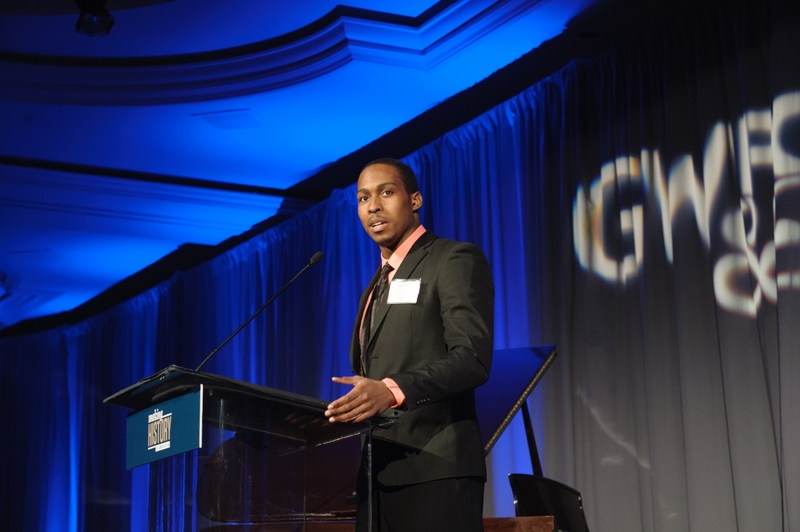 Hear more from Mr. Williams and other GW scholarship recipients in this video. Donors and students meet, share stories at annual celebration of philanthropy.